At Burton Court we believe that every wedding is an individual occasion that should be cherished. We organise your wedding with the emphasis on organising the day that you want and not following a pre set programme, flexibility is the key to this. Unique, friendly and flexible, Burton Court can accommodate the smallest, most intimate of weddings to the largest, grand marquee occasion. We work with you to ensure you have the day that you want, an occasion to be cherished, with professional, friendly advice and help every step of the way. 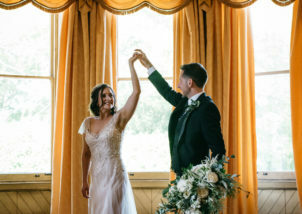 Your celebrations can be held within stunning period rooms inside the house and outside in our beautiful landscaped gardens overlooking Herefordshire’s glorious countryside. Burton Court offers all the finery of a grand house with the warmth and charm of a country home. As a much-loved family home we have a genuine ‘lived-in feel’ that provides a special ambience for yourselves and your guests, one of the reasons we are such a highly sought-after Herefordshire wedding venue. What a beautiful day we had. Everything turned out great and it was so nice to know that you were there to make sure it all went smoothly. Your house and grounds made the perfect setting for our special day a day we'll never forget. Thanks again! We have multiple contacts that can help you with your hair and make up; and we will be on hand to get you a cup of tea or something stronger to calm your nerves. The Master bedroom of the house is available from early in the morning of your wedding day for you to get ready in. This spacious regency bedroom is the perfect place for the bridal party to enjoy those special moments when getting ready. The Edwardian Room boasts dual aspect views of the garden and has wonderful natural light. The Great Hall, the finest in the West Midlands, is a remarkable survival of mediaeval architecture. Dating from 1330 it has been used as a Court of law for hundreds of years and now provides a spectacular baronial setting for the wedding service. The Regency Room, as the name suggests, is full of the elegance of this romantic period with sumptuous bay windows and ornate cornicing. For those looking for a church service then we are spoilt for choice with beautiful churches in amongst the black and white villages that surround Burton Court. We can also offer blessing outside in the gardens. From the formal to the informal, from the small an intimate to the large and extravagant – we can do it. We have accommodated varied entertainments in the past, with games from croquet to laser clay shooting; music from string quartets to live bands; and amusements from magicians to fancy dress. We have even hosted a 20 over cricket match in the parkland complete with umpires and a good wicket! All you need to do is relax and enjoy yourselves in the comfort and splendour Burton Court has to offer. 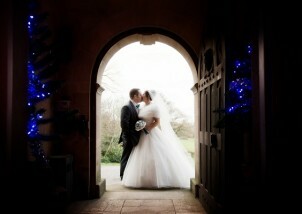 At Burton Court we believe every wedding is very individual to the bride and groom. We pride ourselves on our flexibility about how you want your big day to run. The house and grounds lends itself beautifully for entertaining – it is what the house was built for and has being doing it for centuries. Throughout the wedding reception you have a choice of different period rooms to use or, weather permitting, you could use our gardens and parkland. The principal rooms inside the house provide a beautiful and romantic backdrop for your wedding, perfect for capturing those timeless photographs of your special day. The layout of the house works perfectly for the evening party too. For the larger numbers of over 90 daytime guests or over 150 evening guests then we can arrange marquees to be erected neatly in the landscaped gardens. Sitting pretty on the upper terrace, the marquee site is fully customisable for any size of wedding up to 300 guests. The marquee can be linked into the house through a short connection tunnel so facilities like the bar, caterers' kitchen & toilets are fully integrated into the marquee under one big roof. Whether you plan to manage your own marquee or work with one of our trusted suppliers you can furnish your marquee in superb style and elegance, tailor and adapt it for ultimate comfort and luxury. We particularly like panoramic window walls as all guests get the views of the gardens, the parkland and the surrounding countryside. Edward organised our wedding day and we liked his attention to detail. Everything went to plan and the marquee was ideal for the wedding breakfast. This is your big day and so we only recommend caterers that provide quality food and a quality service. We have worked with these caterers many times and the feedback has always been excellent. Meetings can be arranged with them here during your planning stage and tasting sessions are also available at their kitchens - it is all about making it easy for you to plan. Through our contacts we can offer a variety of ways to cater for your guests from canapés to evening pizza ovens on the terrace. Alternatively, if you wish to use your own caterer then we are happy to oblige so long as they meet the standard of our reputation. Reception drinks can be served after the wedding ceremony in the gardens or in a choice of period rooms. Our preferred wine merchant can recommend the perfect wine to accompany your dining requirements. The lazy butler's bar is available until the small hours. This is a purpose-built bar with a large selection of wines, spirits, soft drinks and draughts including real ale. If there are particular requirements on certain stock items that we don't have then we can oblige for your big day. At the heart of it all is us, your hosts - Edward, Helen and their baby girl Rosabelle. Edward has been running weddings at Burton Court for ten years including his own in 2014 - don't call it a busman's holiday to Helen! Helen has a background working in outdoor education. As a husband and wife team we are here to help and assist as much as is required. We work well together as a team knowing each other's expertise - just don't ask Edward about hair styling (he hasn't got any!) nor Helen the merits of local real ales to be hooked up on the bar! We only like to host one wedding per weekend as we feel it is important to dedicate quality time to the preparations. This means that aspects like the table decorating can be done well in advance helping you to relax in the build-up. We care about how your wedding will be conducted on the day, it is a big responsibility to us and we work hard on making things run smoothly behind the scenes. We pride ourselves that we look after you personally and value getting to know you throughout the planning stages. The standard of personal service we offer is not found everywhere. 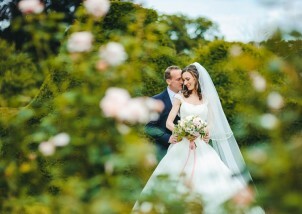 Burton Court was the stunning setting for our wedding with beautiful gardens and elegant rooms. Edward was so lovely to work with and helped us to create a perfect day.